BLOOMINGTON, IN—As the Hoosiers enter the NCAA Tournament for the first time in four years, many commentators are speculating that the 2012 Indiana men's basketball team could be this year's UConn, or at least this year's Arizona, or potentially even a hybrid of 2003's Marquette team and the 1987 Providence squad, both of which made surprise runs to the Final Four. "IU is getting hot at the right time, much like Connecticut last year, but they also have a dominating freshman like Arizona had. Then again, Marquette also had freshman Dwyane Wade in 2003, and Tom Crean also coached that team, so maybe that is the better comparison, especially if you pair elements of that team with the 1987 Providence Friars," ESPN analyst Jay Bilas said Saturday, stopping to backtrack several times during the segment to recount which teams Indiana does and does not remind him of. 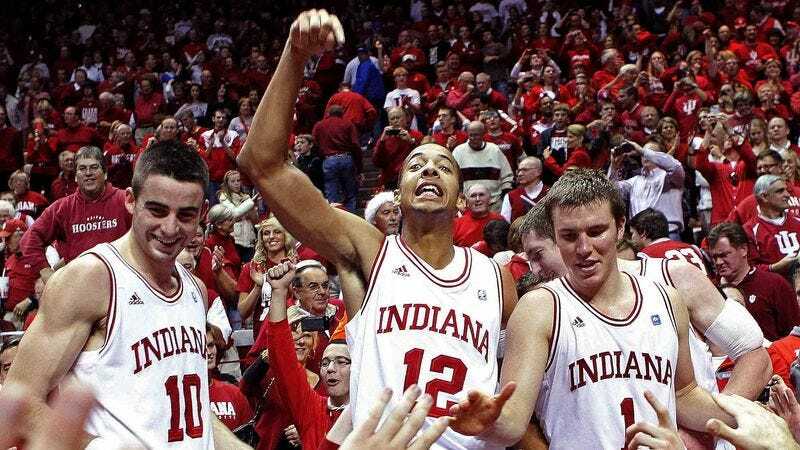 "Ultimately, I see this team making a nice run to the Sweet 16, but bouncing out there, which incidentally enough is exactly what the 1994 Hoosiers did, so I might change my answer. Yeah, that's it—this Indiana team strikes me as most similar to the '94 Indiana team. And maybe a little like Michigan State from two years ago, now that I think about it." After more than 15 minutes, two commercial breaks, and the rolling of a whiteboard into the studio to help parse through several dozen teams from multiple eras, the College GameDay crew agreed that come tournament time, Indiana should appear most reminiscent of the Indiana basketball team that played in the Big 10 Tournament on Friday.